Bring your solar filters and cameras, a Total Solar Eclipse, one of the rarest celestial events on Earth is happening on Wednesday, July 22, 2009! It will be visible between around 8AM and 9AM on that day (at GMT+8hrs, just compute for your own country's time! ;p) in the following countries: India, Nepal, Bangladesh, Bhutan, Myanmar and China. The moon's shadow will then blot out our sun in Japan's Ryukyu Islands before hovering over the Pacific Ocean and eventually disappearing. The solar eclipse will be partially visible for the most of Eastern Asia (including the Philippines! woot! woot! ), Indonesia and the Pacific Islands. 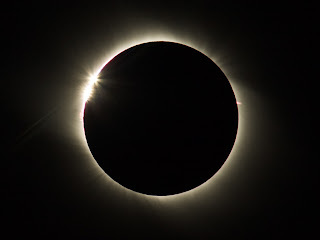 Packaged Tours are available in places in the world where the eclipse will be completely visible, like in India, where they will witness the "100% solar eclipse with diamond ring." It is only the third total solar eclipse to be visible in India in the past 15 years and one has to wait for another 78 Years, to witness such a spectacle again. The next total solar eclipse will occur in 2087. In the Philippines, I remember 2 solar eclipses in my lifetime. The first one was the total solar eclipse on March 18, 1988, when I was a young (and innocent, hehe) 6 year old kid (I just turned 6 the week before that!). I remember my mom brought out a basin of water and told us to look at the reflection on the water and not directly at the sun. Some of my neighbors brought discarded film negatives and looked through those. I had excitedly anticipated the partial solar eclipse of June 11, 2002, but the sky was uncooperative. The clouds hid the sun completely so I didn't even partially see the partial solar eclipse. I did not know about the most recent partial solar eclipse, visible from the Philippines. Apparently there was one last January 29, 2009, but that it was at sunset. it's actually weird because i don't remember a lot of things, but this one is very vivid in my memory. :D I had some google help with the exact dates of course. haha! i saw one on Heroes, does that count? the thought of sitting with your kids aand grandkids is pretty cool. Thanks Jena, yeah, I reposted my past post on the definition of a syzygy and added the email conversation i had with an astronomer. :D He answered your question! Recent blog:=- What is a syzygy? @jan_geronimo stop cheating! hehhehe. where we you guys during the 1988 eclipse? !